Today, we are more stressed-out than ever before. The stress of careers, deadlines, conflicts, and demands on our time and money, take a huge toll on our health and well-being. Just as a chain tends to break at its weakest link, we seem to exhibit stress and strain in the weakest areas of our bodies. Stress basically comes in three forms of overload. We encounter physical stress, emotional stress, and chemical stress. In fact, we are subject to all three stress factors at the same time. When we overload, it always manifests in symptoms at our weakest link. Stress can provoke ulcers, migraines, low back pain, insomnia, and other illnesses. 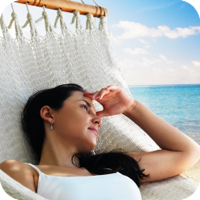 It is impossible to remove all of the stress from life, however, safe all-natural and effective stress reduction strategies can help offset the bad effects that stress produces. This strengthens the function of the nervous and immune systems at the same time, so you can make stress your friend, not your enemy. After decades of research, it is clear that the negative effects associated with stress are real. Although you may not always be able to avoid stressful situations, there are a number of things that you can do to reduce the effect that stress has on your body. The first is relaxation. Learning to relax doesn't have to be difficult. In this section are some simple techniques to help get you started on your way to tranquility. Relaxed breathing, also called diaphragmatic breathing, can help you relieve stress. Have you ever noticed how you breathe when you're stressed? Stress typically causes rapid, shallow breathing. This kind of breathing sustains other aspects of the stress response, such as rapid heart rate and perspiration. To rest your mind and take a visual journey to a peaceful place, consider listening to soothing sounds. If you have about ten minutes and a quiet room, you can take a mental vacation almost anytime with soothing sounds. Consider music such as relaxation CDs or internet radio stations to help you unwind. "This place is awesome. I love the staff, they're all so friendly. Im really hard to adjust and can't just go to any chiro. Dr. Manchester can get my neck to unlock, every time. Make an appointment or just walk in, you'll be happy you did." "The staff is always so friendly and genuinely care how I feel every time I come in. I truly feel like they care about my health as much as I do. I’ve felt better every time I’ve come into the clinic. I’m a whole new woman; I have more energy, I have more mobility and knowledge about how to take care of myself. I would truly recommend this place to all of my family." "Would recommend bfc to anyone...good people. Thank you and ill be back."